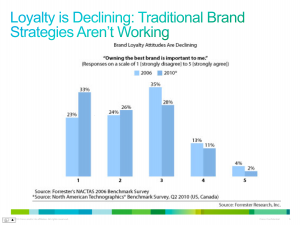 We’re in a new age of competition for brand loyalty (the propensity to repurchase a brand). The battle for market share is fierce and according to Forrester over the past 4-5 years American’s brand loyalty has been declining. People no longer feel that owning the “best” brand is important. This is due in part to economic conditions but there is an even bigger culprit. Technology. Technology is one of the forces eroding loyalty. According to JP Gownder, Rapid innovations in consumer technologies has caused this shift by provided consumers with new tools for comparing, evaluating, choosing and experiencing brands. Anyone selling products today have to deal with the likes of Google Products, ShopSavvy, Expedia or BizRate, who offer both product and channel comparisons, increasing the likelihood shoppers will find a new brand or a better deal to entice them away. There are lots of ways to find a deal. Deal of the day sites such as Groupon that make consumers feel like they are entitled to things at a huge discount. They like to haggle on price and share their stories and tips for how to win (sharing the secrets of inventory cycles at Target or ways to handle “hostile” cashiers who won’t give you a discount). They even share their coupons on swapping sites like Hot Coupons. Online coupons are 1% of the coupons issued but represent 10% of redemptions. Studies have shown that armed with these technologies, customers are becoming increasingly brand agnostic. Statistical analysis shows the more technology-optimistic a consumer is, the less loyal she becomes. Passion for a brand (think Nike, Apple) comes from wanting to be a part of what they represent, a sense of valuing the same things as others who buy the brand and the people running it. Successful companies like these use their goods and services as props for engaging people in their brand story, they focus on creating a meaningful connection. I believe the key to winning the loyalty battle is to use technology to work for you rather than against you. Empower your customer with digital technologies that reinforce the value of your brand, rather than erode it. Design your experiences and services to deliver real value in a practical and meaningful way. For most organizations this will mean rethinking the customer and product experience to find ways to make this connection. Think differently about the role of marketing and add conversion as a metric We tend to focus on marketing to attract. But with all the digital touch points available Marketing shouldn’t just be focused on using digital to generating leads. Explore beyond looking to get the attention of a customer when they are thinking about what to buy (Google, Facebook and Twitter are great at doing that). Look for ways to make them feel a part of your brand. Right now most emotional engagement is still happening in traditional media (especially during the Superbowl). Create content that will pull people in or can be shared. Gucci does an interesting job in store of creating an emotional experience. Connecting with customer’s and helping them with their goals will enable you to know when to take action. There are some existing examples like The Home Depot’s Kitchen Design tool that lets customers to pick potential designs for a kitchen renovation. They can save them to a project folder that can be accessed by a Designer. Bringing together data from various sources to be able enable you to pick up signals that help anticipate customer needs over time. Banks have been paying attention to life events that will cause customers to refinance their home. 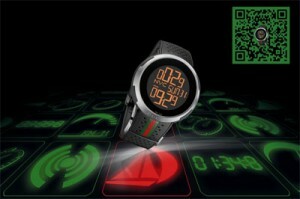 Imagine what you will be able to do as the internet of things increases the amount of touch points. 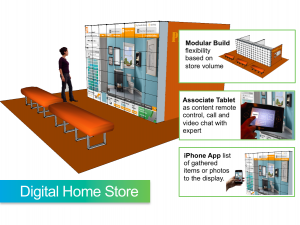 Create an ecosystem by combining digital experiences with the physical products. Manufacturer’s are increasingly looking for how they can offer digital services. Digital Services are compelling because they usually involve the customer contributing data over time so the barrier to switching is greater, they generate new sources of revenue and enable your teams to learn more about what your customer’s want. There are great examples like Nike Fuel Band, iTunes I have covered before. It was about a year ago that I did this blog entry talking about the need to create VALUE. It’s becoming more and more important as core products become rapidly commoditized. Think differently about customer service. Get your employees more connected across channels. Your people are the best at creating connections and driving loyalty. They need to be present online and offline and today they are “trapped” in a specific channel or location. 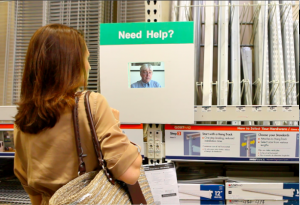 Imagine a consumer electronics expert in a low-volume store being able to serve a customer in a different store through high-definition video, answering questions on Twitter or responding to a question on your website! Find ways to turn this loyalty trend around to make technology a competitive advantage by deliver value to people. We often think about digital and physical as two separate experiences, two separate channels, but to our customer they aren’t really separate any more. We’re moving in to a new age of the internet – first it was about collecting knowledge, then social connections and now with the Internet of Things its about physical space and connecting to objects. This is providing lots of opportunity to re-think the use of digital within physical and get over the failed attempts which were usually because you did nothing more than deploy your website on a stick. Consumers have grown accustomed to the information and ease of connecting when online and would like to have access to information when they are vising you but in a way that enhances real-life. It’s time to leverage this next wave of digital to engage of more senses than those used clicking with a mouse. Keep them in your brand experience by providing what they need: enable them to search for information, get them engaged through storytelling or deliver personalized recommendations and guidance. But do it in an entirely new way. We can look at the digital opportunities across three areas Product, Place and Service with different experiences at different touch points. Expanding beyond a focus of sourcing and merchandising selection to surrounding products with digital experiences. Different product categories require different types of solutions. They can be either subjective (requiring an opinion, being a reflection of taste or personal brand) like clothing or home design, objective (based on factual data) for electronics, home repairs or habitual (grocery). Subjective product purchases need to be carefully considered since the customer’s style preference or personality is driving the decision-making. There are however some interesting examples where this is being done well. Sephora Fragrance Finder is a personality quiz to match you with a fragrance. Read my blog entry Clever “Personalization” by Sephora. 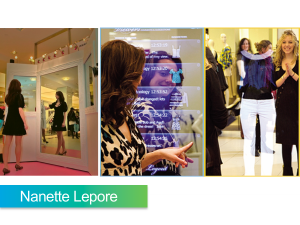 The Social Retailing Mirror & Website we built for Nanette Lepore enables you to ask your friends what they think of your outfit while you are in the store trying it on. See the photos and read more here. We developed a Room Visualizer that will be announced soon that allows you to see products together in a room setting. 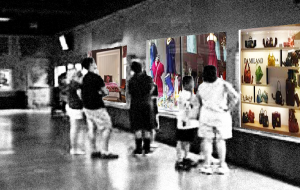 In my early thinking about this (pictured here) I imagined something like this being executed in a “museum-like” setting that would naturally foster interaction and discussion as you are putting together your “masterpiece” of a room. It could also be used for large crowd presentations. Something you can’t do at home on your iPad. They say you can narrow a wall of televisions to three options by asking two simple questions, how big a screen do you want and will you be watching sports? Banks want to make sure there is always an expert there for you if you make it to the branch. 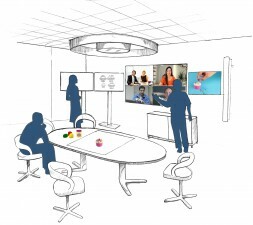 See this video of Cisco’s implementation with the Bank of Montreal. Best Buy has a help force on Twitter ready to respond immediately to your questions or complaints. 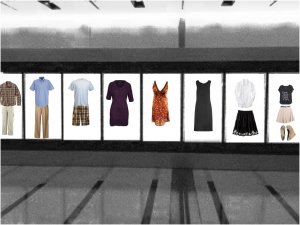 Shopping through window displays or by selecting items to be purchased on your phone is the next wave of exploration. I’ve put a few simple concepts below I think would be interesting for a retailer or manufacturer to explore – imagine the interaction being similar to this Adidas NEO interactive window powered with QR codes. From an organizational perspective all the touch points need to looked at from the perspective of the overall experience strategy: digital content for Product Place and Service are all coordinated in pursuit of Customer Experience excellence. Once the experience strategy is determined, organizations will then need to define a logical step-by-step process for how execution and integration will happen. This is focused on digital installations but WIFI is becoming increasingly important and any experience should be extended to to support customer and employee mobile devices. We continue to see retailers creating experiences outside the 4 walls of the store using QR codes to reach customers, enable engagement and make shopping easy. Read more here. See my last year’s entry on the topic. 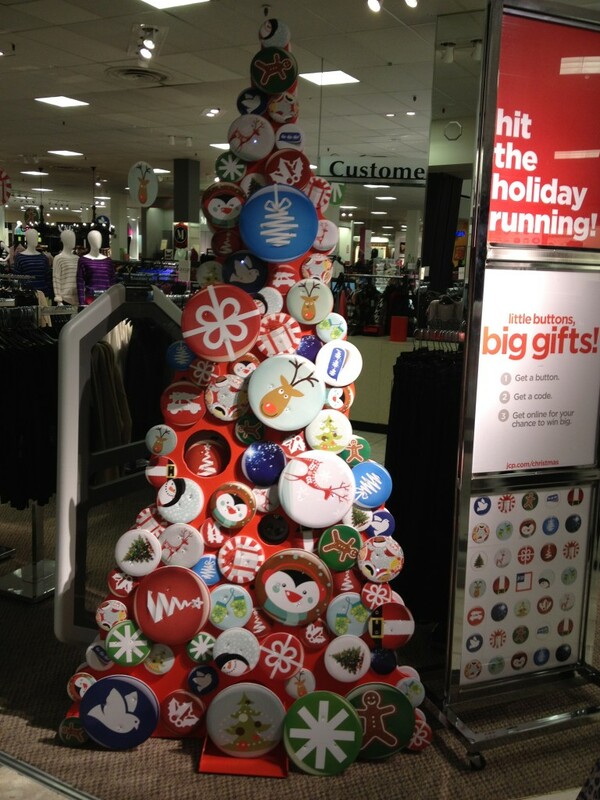 JCP launched a holiday promotion post black Friday where customers pick out a holiday pin at the store. When they get home go to the website and enter a code on the back to see if they’ve won a prize. In order to enter a code you have to first supply an email address. If you win (which I did) you then need to provide your entire mailing address (which I did). Clever way to bring back the abolished “coupons” for a period of time and enable the company to collect email and address information. A bit of history helps to understand why this is really a very clever idea for JCP. JCP is working on building on a new brand experience. They are trying to change customer’s behaviors from looking for coupons and discounts to engage with them differently moving forward. They want to become a brand that brings enjoyment and value to their customer’s lives. They want to transform from being JCPenney to being JCP. Ron Johnson (CEO of Apple and Target fame) wants JCP to be America’s favorite store by helping people live better through offering of brand name products and in store services like haircuts, dry cleaning and family photos. All of course delivered as a great experience that is simple and delightful. This sounds like a great strategy in a world where we’re inundated with content and information and where our lives are very busy. We enjoy shopping but we don’t want to think too hard about making the right purchase and we don’t want to work hard to figure out the “value” of an item. One of the steps taken early on was to change the JCP pricing strategy to make it more simple. 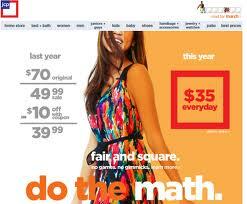 Rather than coupons and constant rounds of markdowns JCP would offer everyday low prices at a fair and square deal. However in doing there was an unintended consequence. Customer’s were used to a loyalty programs where they would earn $10 for every $100 spent and then combine that with coupons to get a great deal. While Ron explained to them in the brochures that they are getting things at the same price, it didn’t replace the feedback loop that kept them coming back. He took away the “game” for the customer – the great feeling of satisfaction they got that they were working the system and getting a deal. While this is impacting sales in the short run there is research to support that Ron is on the right track. It is a question of whether or not he will run out of time. There is a lot of criticism around the JCP strategy. Let’s face it the old paradigm was only creating a race to the bottom and it doesn’t make sense to go back to it to get back sales in the short-term. JCP was seen as a place to bargain shop – not a brand that had an emotional connection for the customer. Not a brand that drove the kind of loyalty and sales seen at Apple. It was time to change the game: reinvent the brand and attract a new customer base. Additionally the old pricing strategy was creating a lot of work for JCP to manage making it very complex all around. I totally believe in Ron Johnson and what he is trying to achieve. I applaud his courage to pursue a vision that is about something bigger. 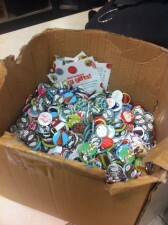 We shall see how the buttons work for them this holiday season. Hopefully customers will come back to the store to use them. I know I will. C-Wonder executes on the Internet of Things, Cloud and Mobile POS! – Mobile POS without a POS system – they have integrated to their ERP backend. This allows them to analyze real-time sales data and give sourcing immediate feedback on what is selling and what is not. – Video from store to the corporate offices. This blog entry sums it up fairly well. Here is an excerpt. “I remember in the good old days (well at least a couple of weeks ago..) when opening a new store required a large hardware investment and was a major store systems project. Servers to be installed. POS terminals to be installed. Checkout Counters shipped. Network cabling run to the counters. Electrical to the Counter. Holes drilled in the counter for wiring and power. Make sure you have all the right connector cables…and enough electric outlets at the front end. Install and mount the payment terminal, pole displays. Connect the scanner. Hook up the printer. (Anyone see the printer cable?) Don’t forget to install an extra register to be used only on Black Friday and the week before Christmas. Load the software and test. Train cashiers on the POS system. Train them again. Open the store. You know the drill. We all do. That’s all changing. What does the future look like? Imagine, if you will — no store servers in the back room, no fixed registers taking up valuable selling space. (and get rid of all those connector cables! 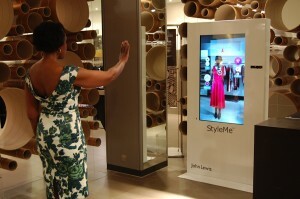 )The future is a retail world where cloud computing powers the store. Web interfaces provide configuration and reporting. Goodbye registers and hello mobile. Tablets, iPads and iTouch’s for management and sales clerks. Scanner and payment peripherals installed before shipment to the store. Software seamlessly distributed from the cloud to every device. Management reports available on the tablets. Intuitive mobile POS on the devices requiring limited to no training. The retail systems for the store of the future will be as simple as sending the iPad’s and iTouch’s to the store, syncing with the cloud POS system, and opening the doors.Yes, I think I saw the future of retail store systems at C-Wonder and it is here now powered by VeriFone – leading the mobile retail revolution. There may come a day when online shopping will represent a larger portion of sales than those made in a physical location but for now it’s still a small percent of overall commerce. While many bricks and mortar are concerned by being overtaken by their online competition they should not forget about the power of the physical space. The physical location is still where most purchases are made. It’s also where you can make the greatest connection to your brand. 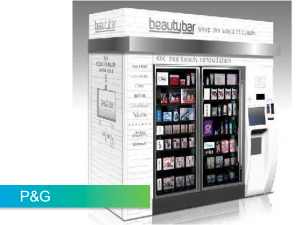 An now pure play retailers are looking to build stronger connections to their customers through physical locations. 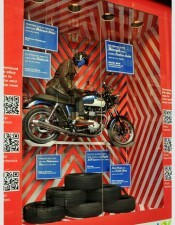 Ebay has used store windows to engage consumers. 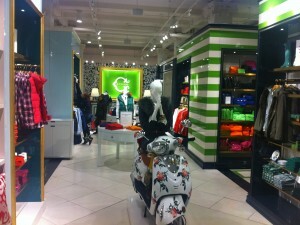 Launched in 2006 only online, Piperlime, a division of GAP, opened it’s first store in New York City this year in Soho. Read a summary on the GAP blog. According to Reuters, Amazon has open physical stores to put the Kindle products in front of more consumers. 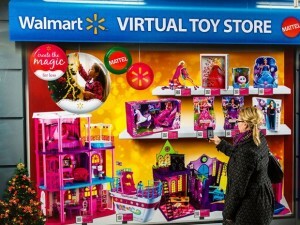 Given how quick it is to get pop-up stores up and running the company could still conceivably establish locations in the US before the holiday shopping season, now that the largest retailer Walmart has wiped its flagship product off its store shelves. It shows you that nothing at the Apple Store was taken for granted. It is not just about technical knowledge and training but about how to treat people. As much time is spent on communication as is spent on technical training. To help CTOs and CMOs navigate this ever-changing landscape, Razorfish, one of the world’s fastest growing digital agencies, has launched volume three of the annual Razorfish 5. The report covers a mix of new technologies and techniques that can help organizations better support an evolving, overly-matrixed world. to segmented groups of online audiences, only 12% have implemented the ability to target a recognized segment on their owned properties and measure the results. versus a prospect on their owned properties. Only 82% of respondents viewed .com as an owned channel. The number drops to 50% regarding mobile. so that content can be served dynamically and reused across segments. All of the aforementioned findings point towards a significant lost opportunity for engagement, and consequently revenue. The article concludes with a plan of attack for companies to bring together technology platforms, analytics, data activation and experience design, in a way that is tangible for most marketers. It’s very difficult for companies to measure the success of your brand-building efforts and to know where to invest. Check out this work done by Landor on Measuring brand experience. They are builing off of the customer journey map to identify the driver touch points in the experience to determine what to measure and where to invest. I think this is a great piece of work but should include more up front thinking on the organizations goals, trends, competitive analysis to ensure there is a clear strategy underlying the brand promise. Border’s Books taught us that while you are focused on building a great experience you need to make sure to keep an eye on the changing business landscape.